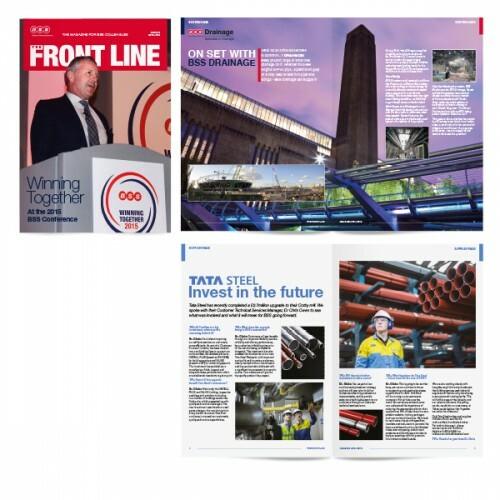 After nearly a decade of using the same design layout, one of our first ever projects, The Front Line, has received a design development. Having worked on plumbing and heating specialists, BSS Industrial’s bimonthly internal newsletter for nearly 9 years, although the old design was still well received by BSS employees, it was decided that this key piece of internal marketing needed to look more professional and feel more like a magazine. The fresh look, which has gone down well with BSS colleagues, has a cleaner, more uniformed look and feel to the pages. With the regular features still making an appearance our job was to update and modernise through larger imagery, more breathing space around the titles and colour coded sectional tabs.